Even though there are a number of people who don’t eat turkey on Thanksgiving, yet when we think of this special day, the turkey stands out as the classic symbol for good eating for both Thanksgiving and Christmas. 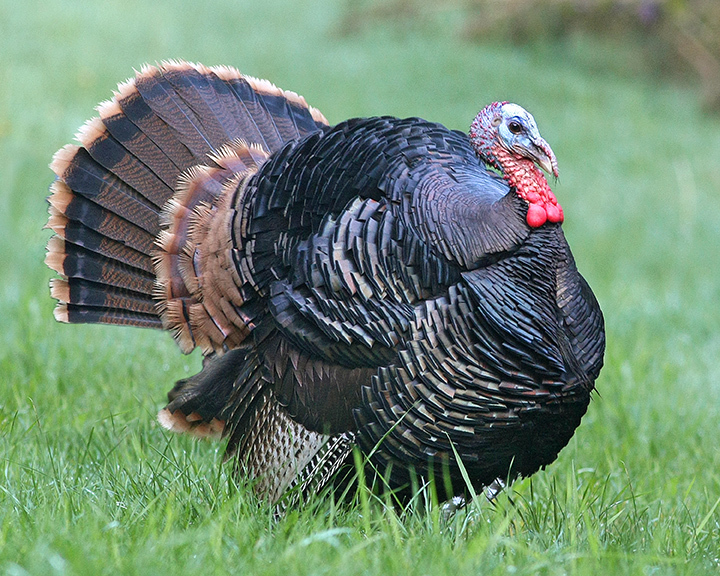 Throughout the history of the United States, the turkey has stood out as an important member of the bird family, in fact the turkey, if Benjamin Franklin could have had his way, would have become the national bird instead of the Bald Eagle. The wild turkey is a distinct-looking bird, with its large size, its iridescent brown feathers, and its gray head and neck which turns a striking shade of red, white or blue when it becomes excited or distressed. The turkey, as well as the peacock, uses his feathers to attract a mate. In the spring, male turkeys, also called “Tom Turkeys” or “Gobblers” puff up their bodies, spread their tail feathers and strut around shaking these feathers letting out grunts or gobbles every so often. This “Turkey Trot” is for attracting as many hens as possible for mates. The Tom Turkey is not monogamous by any means! The hen after mating prepares a nest under a bush in the woods and lays up to 18 tan and speckled brown eggs. She will incubate these eggs for close to a month when they hatch into poults. It will be another two weeks before the poults can fly. The immature turkeys will stay with the mom for up to a full year. During this whole time, the male does his own thing, not helping at all with the raising of the young. His job was complete after mating. 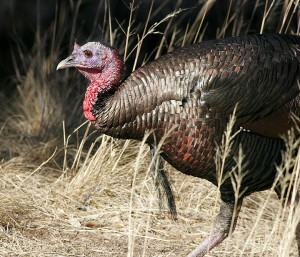 Most people seldom eat wild turkeys. It is the domestic variety that is the main attraction for the Thanksgiving dinner. 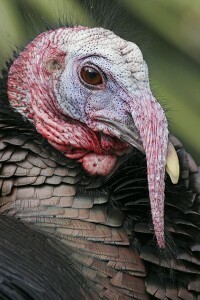 The domestic turkey’s weight is generally double the weight of its wild relative, and because of its weight, the domesticated turkey by and large cannot fly. The pictures I have on this page are of wild turkeys that I have photographed. Most of my turkey photographs I took on my way to Glenwood, Washington. This is a trip I take, at least, once a year in the fall capturing the glorious colors of the aspen and cottonwood that show up during that time. On the way, many times I run across bands of wild turkeys. One day I followed one of these bands into an orchard. I lost them there, but remembered I had my IPod with me which had the Tom Turkey Gobble on it. I played this for a minute or so and soon had the whole group of turkeys(about 15) charging at me being led by a very large Gobbler, tail feathers distended and gobbling for all he was worth. I quickly turned off my IPod and very soon the group quieted down. It was only then, after taking some deep breaths, that I started taking pictures—from my car window. Whether we have turkey or not for Thanksgiving dinner, may we all remember what we are truly thankful for and possibly we could all share that with at least one other person.